Thanksgiving is a little more than a week away. By now you’re probably trying to finalize which method you’re going to use to cook your turkey. Perhaps spatchcock-ing? Perhaps deep frying? Maybe an adventure in Turducken-ing? The world is your oyster turkey tail. There are lots of decisions to be made. Like, are you going to put bacon in your brussel sprouts? You probably should. Or, is it a good move to make your own pie crust? If you have the time, I totally vote yes. Or, should you sit your cranky Aunt Millie next to your cousin’s new boyfriend who curses like a sailor? Probably. Do you mess with the way your Italian grandmother insists on arranging the peppers on her requisite antipasto plate? NEVER. Don’t touch that. She’ll smack your fingers with a spoon. I know this from experience. Do you still allow the relative who can’t remember to refrigerate anything to bring a mayonnaise-based dip? Yikes. Who doesn’t love a gamble? So many decisions. Any way you look at it, Turkey Day can be a lot of work. Holidays are inherently stressful. Let me help. I’m making you a cocktail. You’re welcome. So, for this cocktail I’m using a juicer. Are you rolling your eyes and finding this step slightly obnoxious? Oof. I’m sorry. I promise it’s pretty darn easy, and the end result tastes great. I really wanted a super fresh cocktail to balance out the inevitable gravy sweats. You know what I’m talking about. Those unavoidable “I’ve put gravy on everything so now I look like Dom DeLuise on a hot August afternoon” sweats. Yeah. We’re going to juice fresh green apples, ginger root and lime to give us our mixer. Top it off with some sparkling water (or ginger beer if you’re fancy) and splash of vodka? Oh yeah, baby… we’ve got ourselves a cocktail. Drink up. Need more cocktailing inspiration? 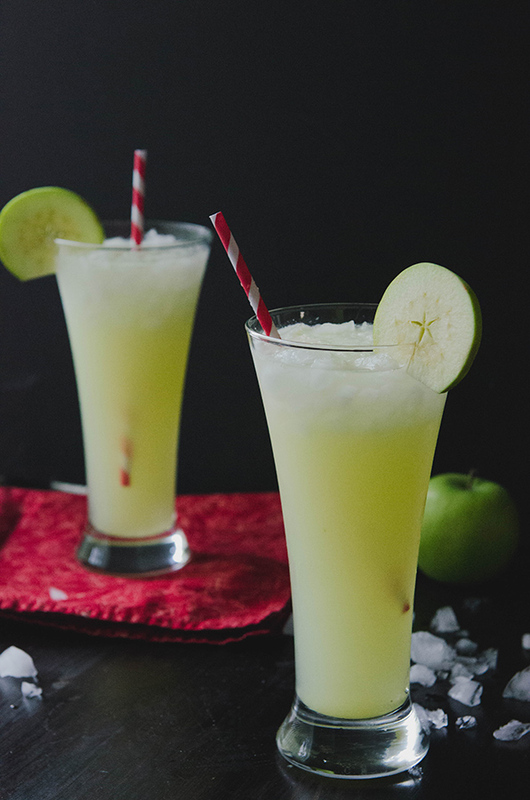 Try out these drinks from the archives! Looking for some more Thanksgiving inspiration? CLICK HERE to check out THIS post full of awesome recipes for your holiday table! The juice portion of this recipe will make enough juice for about 4 cocktails. The cocktail recipe tells you how to assemble a single drink. Happy Cocktailing! 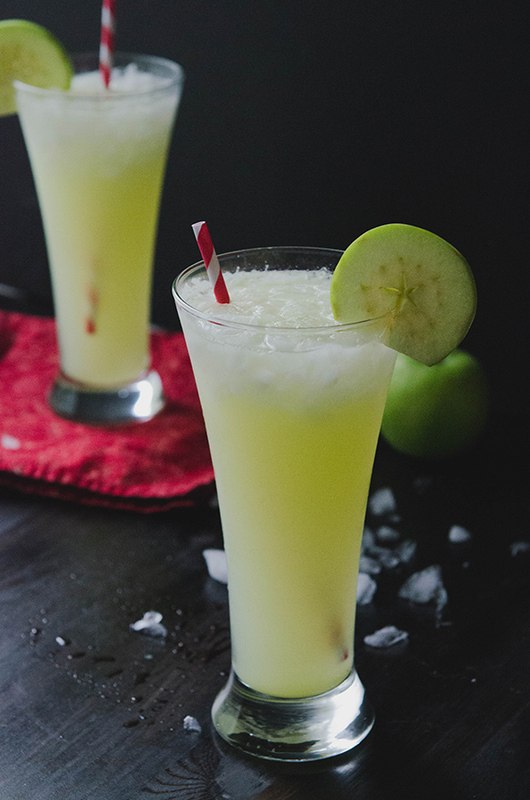 To make the juice for this cocktail, run the apples, ginger and lime through a juicer. Set aside. Add crushed ice to a tall cocktail glass until it's more than halfway full. Add the juice and vodka and stir well. Top your drink with sparkling water for a tart cocktail or exchange the sparkling water for ginger beer if you like a sweeter cocktail. Garnish with an apple slice if you're fancy. Bottoms up! We’ve spatchcocked the last three years and I see no reason to ever do it a different way – the only problem I have with it is the name. I’ve been know to add vodka to fresh juice, it’s totally win-win in my book! Have a great Thanksgiving!